The Golden Island brand specializes in fusing together the more popular asian flavors Americans enjoy and infusing them into beef jerky. I never exactly knew where the "chili lime" flavor combination came from, but I know that I see it in many recipes these days. Golden Island says it came from the cuisines of Thailand and Vietnam. For some reason, I thought it had its roots in hispanic cultures. Golden Island is owned by Universal Food Company, a third generation family-run business that started in 1952 as a manufacturer and wholesaler of specialty meat products in Taiwan. In 1983, they began producing asian food products for specialty markets in the USA under the "Formosa" brand. In 2002, they launched the Golden Island brand of beef jerky. I always felt that Golden Island's approach at infusing asian flavors into beef jerky is a great idea. I just wonder why they haven't expanded it beyond the same four varieties they've offered over the past several years. If I might make a suggestion to them that could help sales, try getting some better meat, or find a better meat processor. 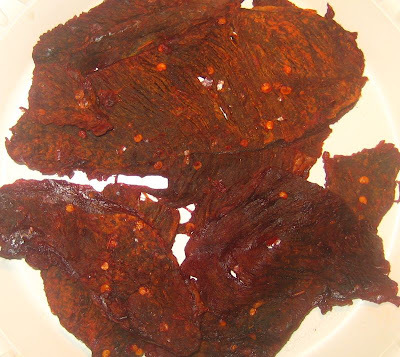 Beef, chili lime seasoning (modified corn starch, maltodextrin, sugar, spices, salt, corn syrup solids, citric acid, onion, garlic, paprika, natural flavors, extractive of paprika, lime oil, silicon dioxide), sugar, soy sauce, lemon juice, soybean oil, salt, crushed red chili pepper, potato starch, chili powder, natural lemon emulsion, citric acid, paprika, sodium erythorbate, sodium nitrite cure, yellow #5, garlic powder, onion powder, disodium inosinate & disodium guanylate, red #40. Biting into a piece, what I taste first is this citrus flavor, not necessarily lime, or lemon, or orange, just citrus. The citrus flavor is not that strong either. It's noticeable, but it doesn't hit you with a baseball bat. In fact the pieces probably have a stronger citrus aroma than they do taste. The chili seasoning is noticeable too, but is not strong. 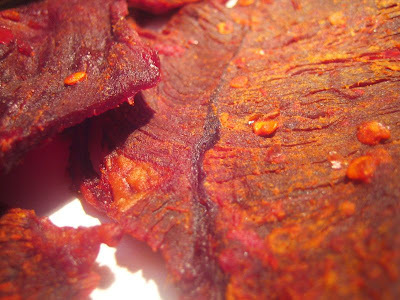 This jerky is not hot by any means, it's not even medium hot, just mild. Even if you're not used to hot foods, I think you'll consider this mild as well. That's a disppointment because the package makes the claim that this is "HOT". The natural meat flavors are also noticeable, but again, not very strong. I can't even say this is very salty either, which is a good thing for me. I don't like salty jerky. There is another taste in this, and is probably the result of some other chemical ingredient. But it gives off the taste of real chinese food. If you were at a Chinese restaurant, digging into a piece of orange chicken, or mongolian beef, there's this "chinese-like" taste you experience that is present at all chinese restaurants. This jerky has it too. Overall, this jerky has a decent taste. I would prefer to taste more lime and more chili. I think adding a third flavor ingredient would make it more interesting. These are real cuts of meat, sliced in medium to thick slices, and in small, medium, and large pieces. There is just way too much gristle in this. Take a look at the close-up photo below, where I centered a line of gristle running up one of the slices. Every medium and large piece had gristle either running up the middle, or along the sides. Most bites I took contained some chunk of gristle. I found myself pulling off strips of it, or nibbling the meat off of it. The pieces range from soft and tender, to hard and dry. Once piece was very tough to eat. I found another piece, by contrast, that was soft and semi-moist. Overall, I'd say that these pieces are dry, and require a moderate amount work to tear apart and chew. I did find some small chunks of fat on some pieces. 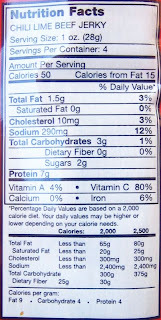 I paid $5.99 for this 4oz bag at a Cost Plus World Market in Temecula, CA, working out to a price of $1.50 per ounce. That puts this in the average price range. I'd say this jerky has a fair value. The taste is ok, possibly even good. But the meat consistency detracts too much from the overall enjoyment of this jerky. It's mainly the abundance of gristle that turned me off. The fact that it requires some effort to tear apart and chew is worth mentioning, but I can overlook that if the taste is great. In this case, it's not "great". As a "chili and lime" variety, this does offer the taste, but just not enough of it. If you're going to market something as "chili lime", it ought to taste plenty like it. I giving this a "fair" rating. The biggest thing I look for is "snackability", meaning how well does this satisfy my urge for snacking? I don't feel that compelled to keep reaching for another piece. I'm at the last piece, as I write this sentence, and already I'm thinking of handing it off to my dogs. If the meat consistency were softer, easier to tear off and chew, and didn't contain any gristle, I would probably keep reaching for more. The taste is good, but just enough of it. Being this is a chili-lime variety, it needs more chili and lime.